Luther is back. Pitted against his most chilling adversary yet, haunted by the ghosts of his past and hell-bent on retribution, he's drawn into a terrifyingly complex case that pushes him closer to the edge than he's ever been. Written and created by Emmy-nominated Neil Cross and directed by Sam Miller (No Good Deed, Fortitude) the Luther special will also star Rose Leslie (Game of Thrones, Downton Abbey), Laura Haddock (Guardians of the Galaxy, The Inbetweeners), Darren Boyd (Fortitude, Spy), John Heffernan (Jonathan Strange & Mr Norrell, Ripper Street) and Patrick Malahide (Indian Summers, The Paradise), with Michael Smiley and Dermot Crowley returning as Benny Silver and DSU Martin Schenk respectively. We have a new video and photo with Idris Elba as Luther on the set of this two-part miniseries. Luther is a BBC In-House Drama Production and BBC America co-production distributed by BBC Worldwide. It was commissioned by Ben Stephenson, Controller, BBC Drama Commissioning and Charlotte Moore, Controller, BBC One. The executive producer is Elizabeth Kilgarriff for BBC Drama Production, England and the producer is Marcus Wilson. Elizabeth Kilgarriff had this to say in a brief statement. "It's very exciting to have Idris Elba back as DCI John Luther and to be in East London shooting the show's fourth installment. Neil Cross has pulled out all the stops to make this the biggest, scariest story yet and it's a privilege to welcome such a glittering array of acting talent to our already stellar cast." Luther is part of BBC America's ground-breaking drama slate including Orphan Black, Broadchurch, Ripper Street and upcoming titles Jonathan Strange & Mr Norrell, Tatau, London Spy and The Last Kingdom. 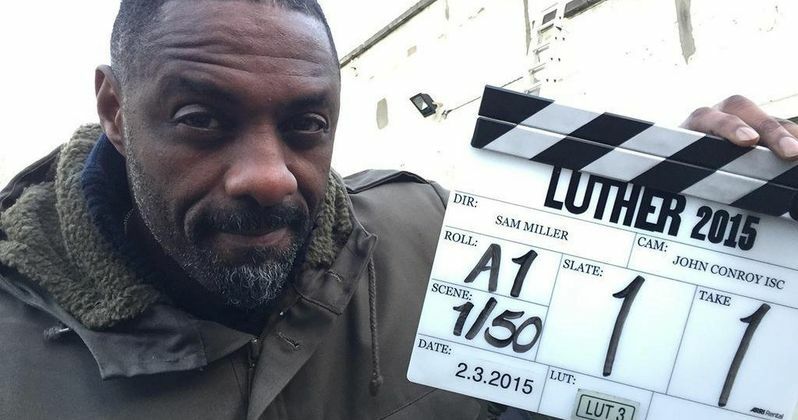 Take a look at the first video and photo of Idris Elba back on the set of Luther. The two-part miniseries will debut later this year, so stay tuned for more details.